The design of driveways affects the speed of traffic turning into and out of driveways and in turn the speed differential between through traffic and turning traffic. Large speed differentials are associated with higher crash rates and diminished traffic operations. Driveway designs should always be based on the results of a study of the traffic likely to use them; these guidelines are presented to illustrate good practices for driveway designs. 940.16.1 LINING UP DRIVEWAYS ACROSS ROADWAYS. Driveways are to be as closely lined up with driveways across roadways without non-traversable medians as much as possible even if this produces less spacing between driveways. 940.16.2 ANGLE OF INTERSECTION TO THE PUBLIC ROADWAY. Driveways that serve two-way traffic are to have angles of intersection with the public road of 90 degrees or very near 90 degrees. Two-way traffic driveways with skews greater than 20 degrees are discouraged. One-way traffic driveways are to have skews between 0 and 30 degrees. The larger the radius, the faster the turning vehicle can get off the road and fewer through-movement vehicles need to slow. 940.16.3 RIGHT-TURN (APPROACH) RADIUS. Approach radii are to be large enough to allow vehicles to enter at a reasonable speed. The following are suggested as acceptable approach radii and are measured from the edge of the driving surface of the roadway. Any maximum approach radius is allowable for driveways. Determine inside radii on a case-by-case basis given driveway angle, traffic volume and other relevant factors. 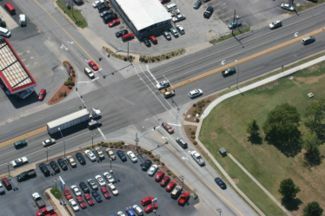 Sites that generate substantial large truck traffic need inside larger radii to accommodate the wheel path of the turning trucks. Adequate driveway width can help turning vehicles get off the road with a greater speed and less encroachment into oncoming driveway traffic. ** Driveway striped for two lanes. *** Driveway striped for three lanes. **** Driveway striped for four lanes. Curb on approach all commercial and industrial driveways. 940.16.5 DRIVEWAYS AND ACCOMMODATION OF PEDESTRIANS. In current and future urban locations, all driveways are to adequately accommodate pedestrians using sidewalks or paths. The narrowest practical width is to be used to accommodate pedestrians. Medians are to be considered on driveways, four lanes or wider, to provide a refuge for pedestrians. 940.16.6 DRIVEWAYS AND ACCOMMODATION OF BICYCLES. Where a driveway crosses a bicycle facility, design the driveway and the bicycle facility so as to accommodate the safe crossing of bicyclists. 940.16.7 TAPERS. The distance between the entrance and exit tapers of adjacent driveways is to be 50 ft. or greater. If not, the tapers are to be eliminated and the shoulder paved to form a turn lane. For low traffic volume commercial and industrial driveways (below 150 peak hour vehicles in both directions), the shortest desirable driveway throat length is 20 ft. (about one 20-ft. car length). For medium traffic volume commercial and industrial driveways (150 – 400 peak hour vehicles in both directions), the shortest desirable driveway throat length is 60 ft. (about three 20-ft. car lengths). For high-volume driveways (over 400 peak hour vehicles in both directions) such as a shopping center entrance, the adequate throat length is to be determined by the results of a traffic study. 940.16.9 VERTICAL GEOMETRICS (DRIVEWAY GRADE CHANGE). Design access driveways on arterial roadways so vehicles can proceed into or out of the driveway at a speed that will prevent large speed differentials between turning and through traffic. Required apron lengths and desirable grade changes are shown in the table below. The apron is a relatively flat area where the driveway meets the public roadway. These guidelines apply to all types of driveways, including for residential, commercial and industrial. Driveways are to have a minimum grade change of approximately 1 percent to provide for adequate drainage. Either an upgrade or downgrade can be used. Notes: The Apron Length is shown as “A” and grade change as “D” on the diagram below. The grade may change along the course of the driveway, as indicated by G1 and G2. In such cases, it is very important to ensure that the minimum apron length is maintained. Required driveway surfaces depend on the roadway they are entering. Having paved driveways is most critical on major roadways to keep the speed differential between through and turning traffic as low as possible. As noted before, all commercial and industrial driveways are to be curbed on approach. This page was last modified on 22 October 2018, at 14:30.